“A coincidence is nothing but an explanation waiting to happen” is the modus operandi of Jackson Brodie, ex-policeman and now private investigator, who is the main character in Kate Atkinson’s crime series, of which this book forms the third offering. Well that’s good, say I, because it doesn’t do to take all the coincidences woven into crime fiction too seriously. I love the subversiveness of Kate Atkinson’s writing. She has detectives who really don’t want to investigate crimes; she has little interest in the perpetrators of crimes but instead focusses on the victims and by-standers, and things happen just “because”. There’s no need to lie in bed afterwards asking “But why…. ?” or “Just hold on a minute….” about the plot. It just is. Her books generally start with a bang, and this one is no exception. A horrific crime occurs within the opening pages, then the book leapfrogs some 25 years. Victims have grown up, and perpetrators are about to be released from jail. Detective Chief Inspector Louise Monroe, whose unresolved love-interest with Jackson Brodie has extended over the series, is obsessed with a recent appalling domestic violence crime, and somehow all these crimes are brought together through a series of coincidences, missteps and what-ifs. This is the third book in the series ( I reviewed an earlier book ‘One Good Turn’ here) , but it is not necessary to have read the earlier books. If you have, then you get the warm inner glow of recognizing carry-overs between the stories, but they would pass a new reader by. There’s a humanity about her writing though, that challenges the sometimes clinical omnipotence of the crime writer. She is messing with the pomposity of the genre and once you lie back and let it all wash over you, it’s a fun ride. Read because: it was the July book for my face-to-face bookgroup. Thanks for this. 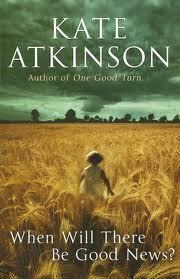 I am enjoying Atkinson’s crime series, so it’s good to have a new one. There’s another one after this too! I’m saving it up for a reading drought!